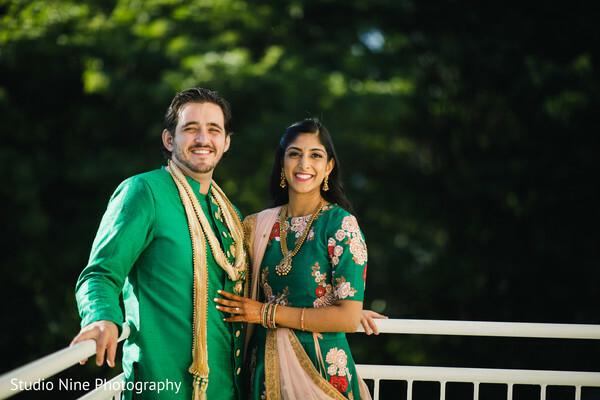 All posts with Color "Green"
As a post-Valentine’s Day treat, Studio Nine Photography + Cinema brings us a glorious South Indian fusion wedding that will sure keep you in the romantic mood! 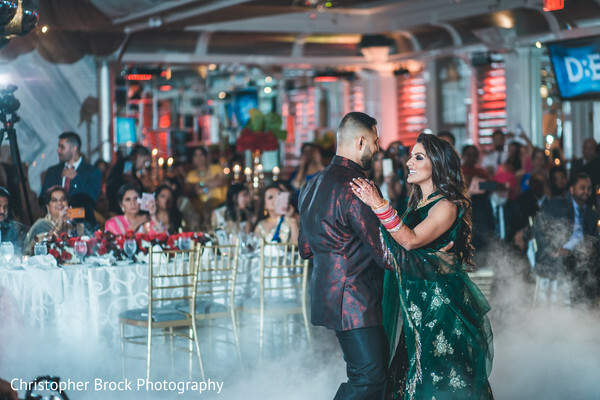 Before the auspicious day, the wedding festivities began with a joyful party celebration of a Sangeet/Mehndi combination that involved dancing and traditions combined with a Cuban theme in honor of the groom’s background! 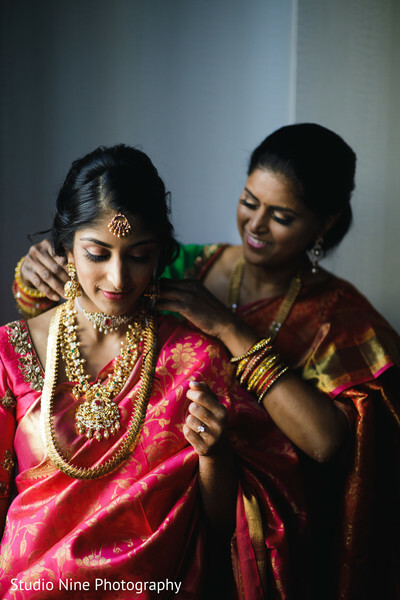 It was finally the ceremony day, and our bride-to-be, Mounica, was dolled up by the celebrated beauty artist Sonia C to marry the love of her life! 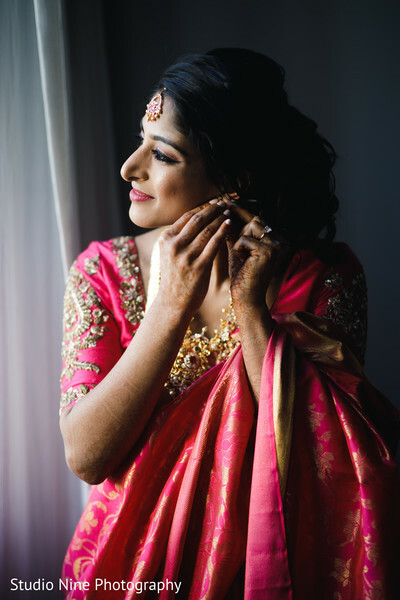 She put together a classic yet mesmerizing trousseau with a selection of deep pink and gold color Kanjeevaram silk saree, completing the look with shimmering gold temple jewelry! 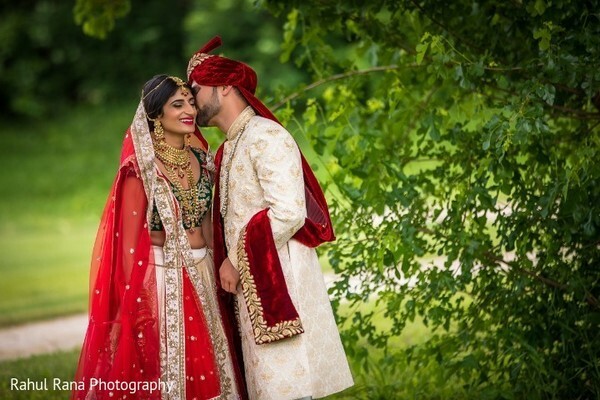 All primed, Maharani Mounica was ready to unveil her bridal look to her dapper groom Evan! 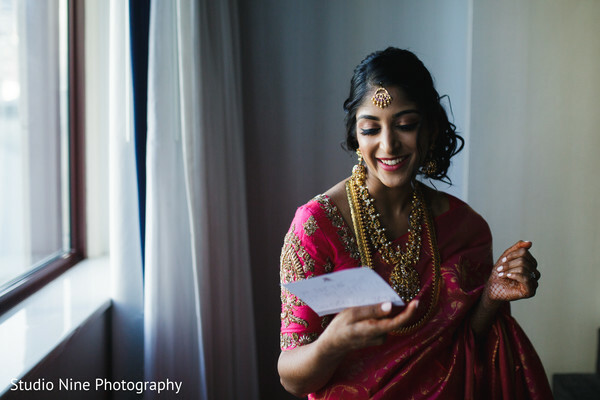 See more portraits of this sweet bride in the full gallery! Evan and I met in Philadelphia in the Spring of 2014. He was in his last year of dental school and I was in my third year of medical school. Our first date was at our now favorite wine bar in the city - Tria. We really hit it off and looked forward to spending more time together. I knew he was "the one" when our relationship seemed so effortless. It was also when he was moving back to Tampa after graduation for work, and we both knew without hesitation that we felt committed to one another and that we would do long distance. I then moved down to Florida after graduation for residency. The rest is history! Planning our wedding felt extremely overwhelming at first. We didn't know many vendors or really even where to start. 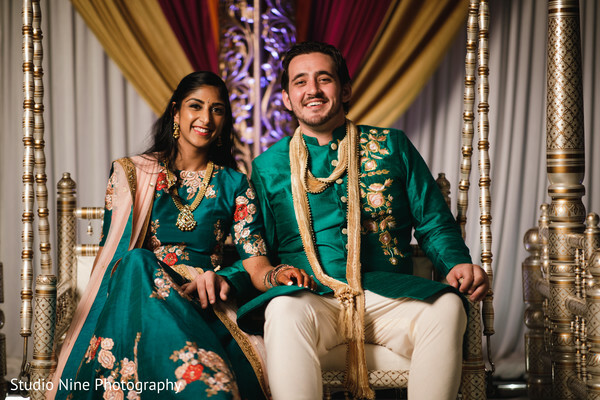 We were also attempting to combine different elements into a traditional Indian wedding, as my husband is Cuban-American. 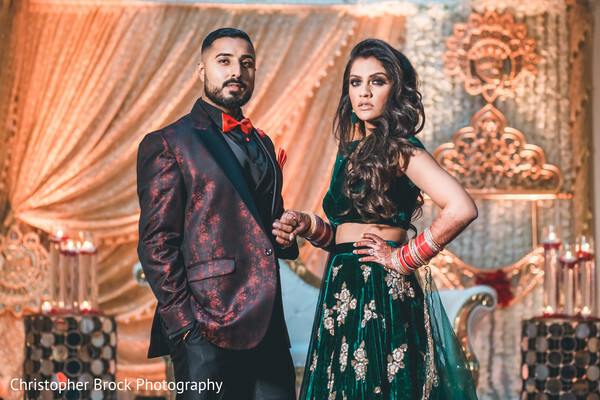 Luckily, I had a long engagement and started with online websites, Pinterest, Indian bridal magazines, Instagram, and just asking around for advice. I also went to a bridal show for some inspiration. 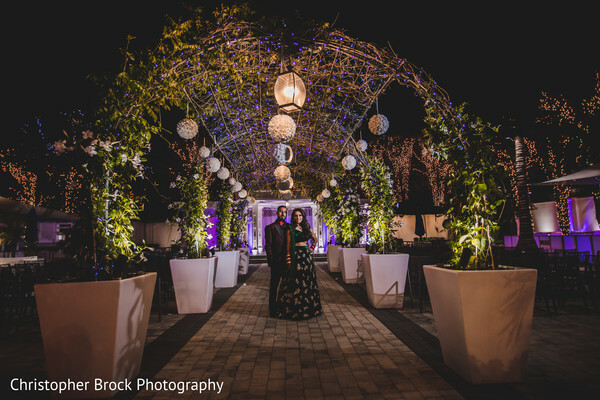 My mother and sister did a lot of research and ended up planning a lot of the details - including venue, food, decor theme and more. 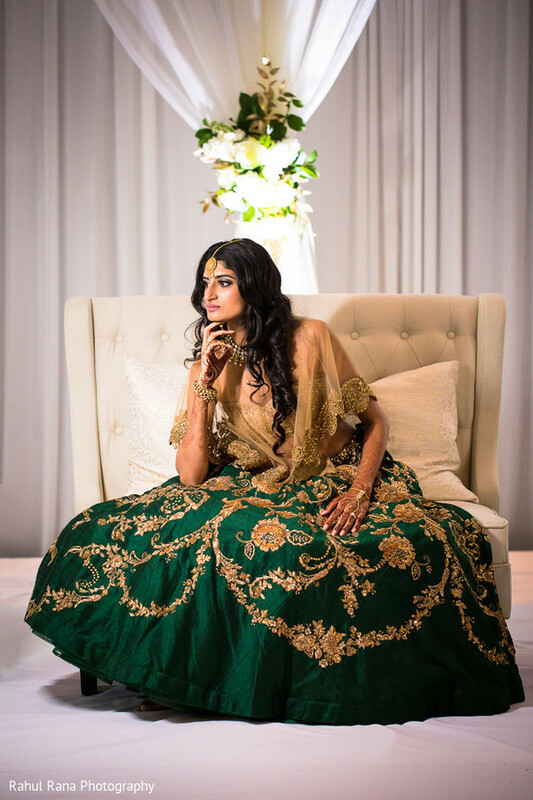 My aunt Shravani in India also helped immensely with the planning and coordinated outfits, invitations, and more. I had in mind that I wanted to book Studio Nine for photo/video based on their previous work, and started there. We went back to Philadelphia for a quick trip and toured different venues. 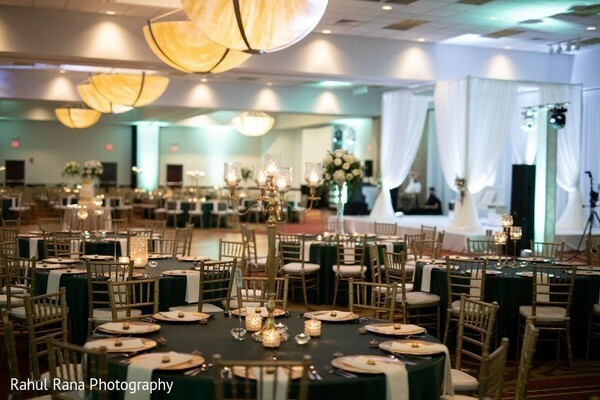 We fell in love with the Ballroom at the Ben and thought it would be perfect for our wedding. After that, we just spent time contacting different vendors for the day of coordination, DJ, hair and makeup, decorators, etc. We went with people who we felt had a lot of experience, were responsive, and the easiest to work with. They were all extremely professional and our guests raved about every single one! I knew I wanted the classic colors of gold and red incorporated into the decor and into our outfits. I wanted something timeless and romantic. My mom and sister went to India for a week and went shopping with my aunt in Hyderabad. They all have great taste so I trusted them to pick out my wedding outfit, and they did a great job. They bought a deep pink Kanjeevaram (silk) Sari in Hyderabad. 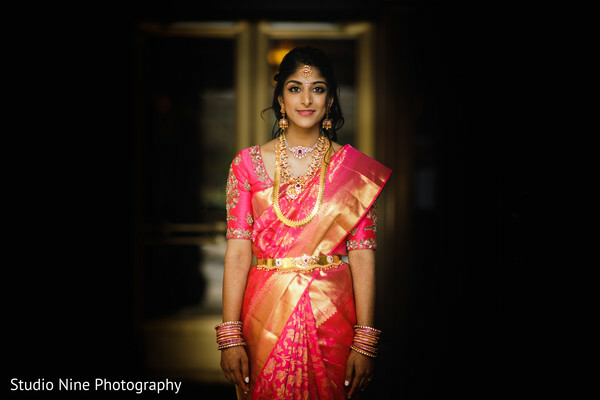 My reception outfit was from Shyamal & Bhumika. 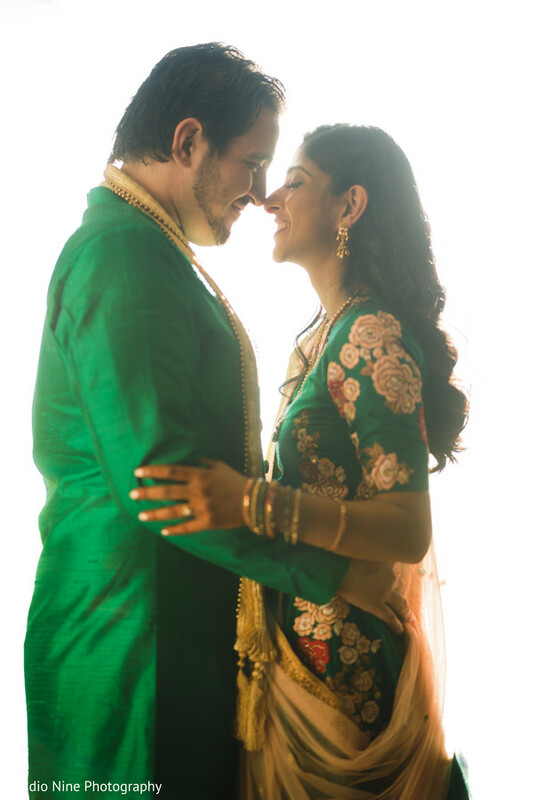 We saw it online, messaged them through WhatsApp, and did the measurements via facetime! They shipped it over and it fit perfectly. I felt that the planning process was very stressful, but at the end of the day, it was all worth it. My parents, sister and I were able to spend a lot of time together planning. It was also fun to introduce our culture and traditions to Evan's family, and they embraced everything wholeheartedly. We also had a large number of family and friends that helped us execute our vision. Without all of those people, we would not have been able to pull it off. It was amazing to see them all step up and help my parents the weeks leading up to the wedding. All of our guests told us they had a great time at all of the events - and it really showed! They appreciated how organized everything was, thanks to Tum Hi Ho Events. Our DJ/emcee from M4U Events was amazing and the dance floor was never empty. Mirchi Mt.Laurel also did a great job with the food, especially incorporating some American elements into traditional Indian cuisine. Overall, we felt that this day was not just about us but really about everyone who attended and supported us throughout our relationship. We wanted everyone to feel welcome, enjoy new traditions/customs, and have a great party. There was nothing but joy and good vibes over the weekend, and we are grateful for everyone who made it so fun and enjoyable. 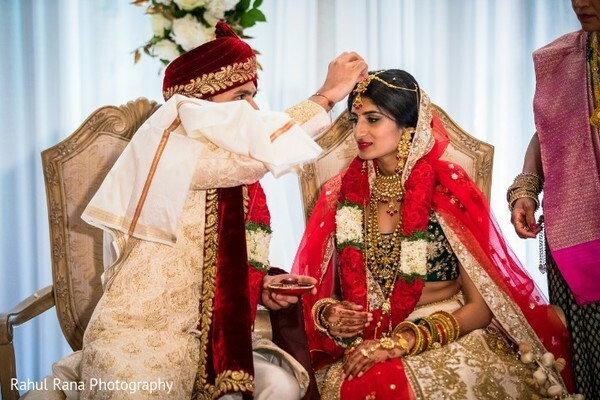 My favorite parts of the ceremony were the "Thalambralu," when we showered each other with rice and flowers. I also loved the ending of the ceremony, "Sapthapadi” when we took our seven steps around the fire. It felt very spiritual and peaceful. My favorite parts of the reception were our first dance. 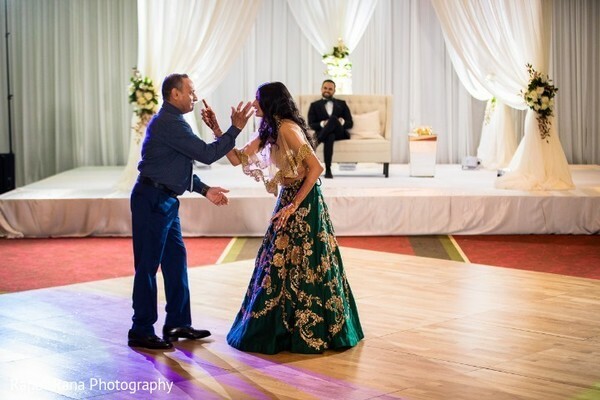 We also got married on Father's Day, so after I danced with my dad, we asked all the fathers and daughters to join us on the dance floor. Everyone danced to “You’ll be in my heart” to Phil Collins. Looking out and seeing so much joy and love on the dance floor made me extremely happy. 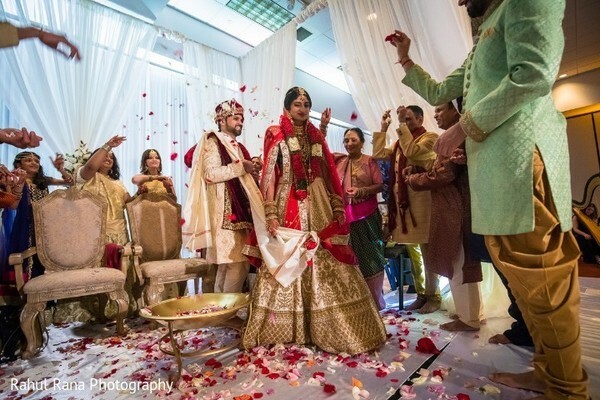 We started on Friday night with a combination Sangeet/Mehndi ceremony. We decided to make this a “Cuban” themed sangeet as Evan is half Cuban. 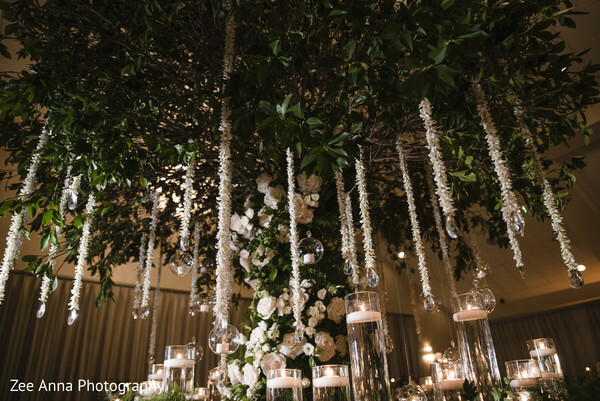 The décor had lots of tropical elements, and flower arrangements were done by Evan’s father, Frank Prado. 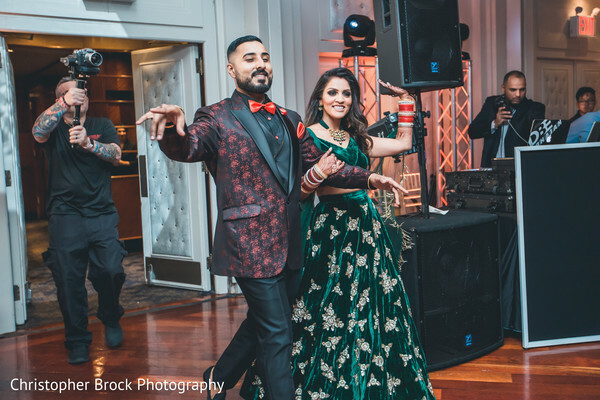 We put forth our best Bollywood effort, and the groom’s side also participated with salsa dancing and ended with a Conga line. The following day, my side had the “pellikuthuru” ceremony at my house. This was followed by lunch at our local clubhouse. On the same day, as much of Evan’s extended family was new to the area, they all gathered for a Bus tour of Philadelphia in the morning. Evan’s father had rented out a double-decker city tour bus that showed our guests the historical and must-see modern sites. They ended with lunch at Pietro’s on South Street. Sunday, June 17th, was then the big day. Everyone gathered with Evan at Washington Square Park for the Baraat. Evan was on his horse, and everyone paraded down Walnut Street, took a right onto 9th street, and ended at the venue. They had Cuban hats, maracas, and personalized sunglasses on the way. We encouraged everyone on both sides to participate and they had a blast. We had had the ceremony and lunch, followed by the reception in the evening. Enjoy the ride, even if it's a stressful one. I would also say to be open to compromise, as everything ends up falling into place at the end, and it will be a wonderful day. 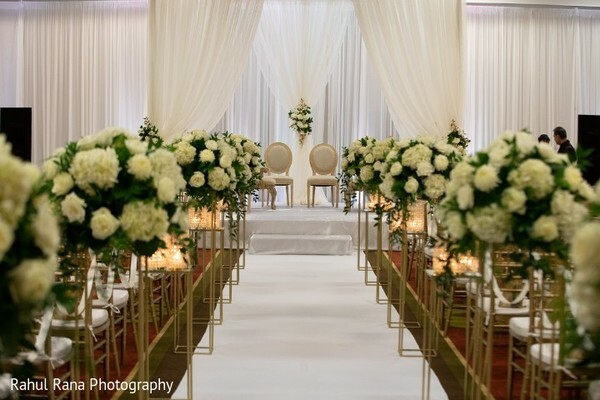 Venue: Ballroom at the Ben - Philadelphia - we loved the central location of the ballroom and its traditional, classic, timeless beauty. Ott, our maitre'd, was also amazing and made sure everything went perfectly! Photo/Video: Studio Nine Photography - Zach Blum and team, and they did an excellent job. Coordination: Tum Hi Ho Events - Kept everything running smoothly and on time! This was absolutely one of the best investments we made towards our wedding and could not have imagined the day without them. Entertainment: M4U Events - kept the dance floor packed all night! We had quite a few people tell us it felt more like a concert than a reception. 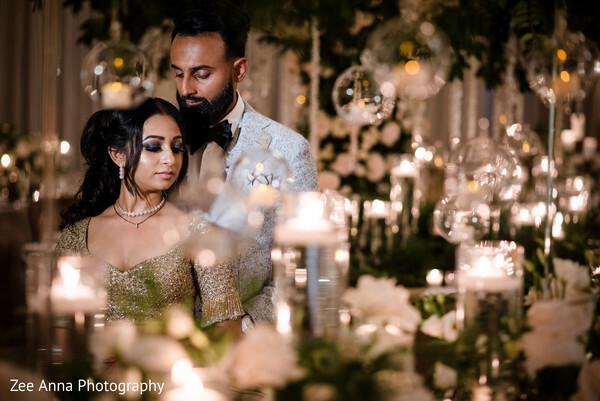 Florals: JP Decors, New Jersey - They did a beautiful job with the mandap and flower wall, as well as the bouquets and centerpieces. 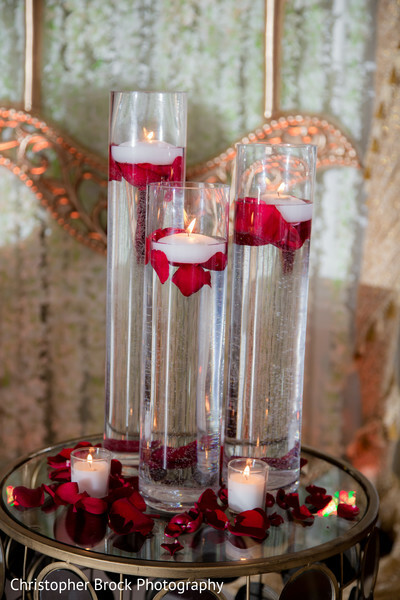 We had hot pink, ivory, and regular pink roses, as well as hydrangeas and orchids. Catering: Ceremony and Reception: Mirchi Mt. Laurel--New Jersey - Lunch was more South Indian brunch style, with pasta and burgers as well. Dinner was Indian, including fish, goat and chicken curry dishes. We also had an Indian staple – Biryani, as well as samosas and chicken and lamb kebabs. The ceremony is coming right up! 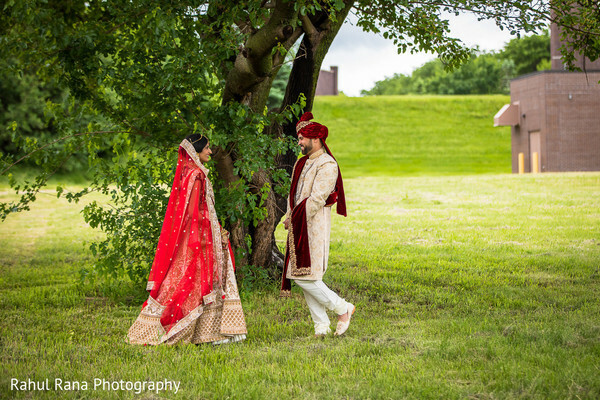 Studio Nine Photography + Cinema, M4U Events and Tum Hi Ho Events are members of the Platinum Guide. Love what you see? Explore their portfolios. 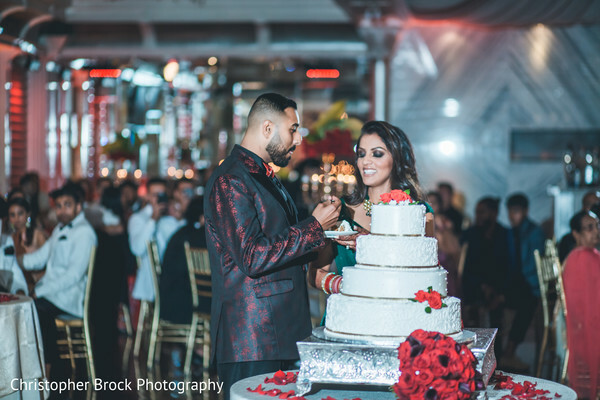 The luxurious catering facility in New Jersey, the wonderful Chateau Briand received Malvika and Hardeep who were ready to celebrate their bright future together with an upscale reception! 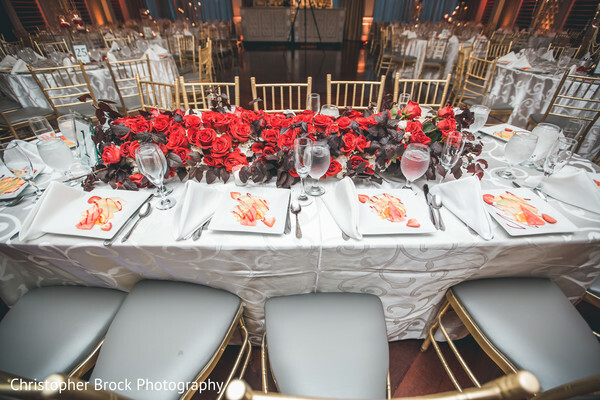 Christopher Brock Photography snapped some of the most wonderful details from the soirée, which featured a majestic floral and décor, designed by Glamorous Event Planners! 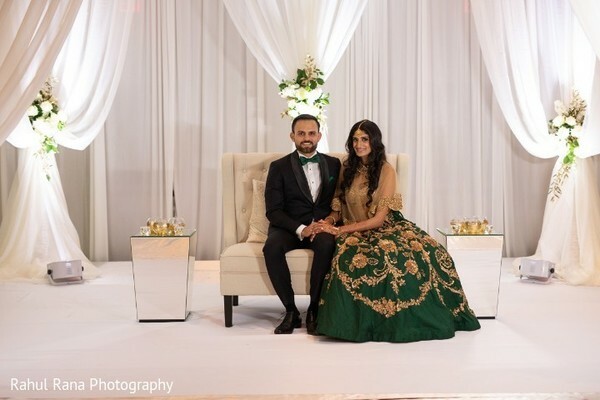 Donning a spectacular dark green evening gown draped and tied by Kanwal Batool and a smoldering look created by KC Makeup by Karuna Chani, Maharani Malvika had an unparalleled striking style, while her beau Hardeep look undeniably sharp in a stylish dinner jacket and custom velvet slippers! 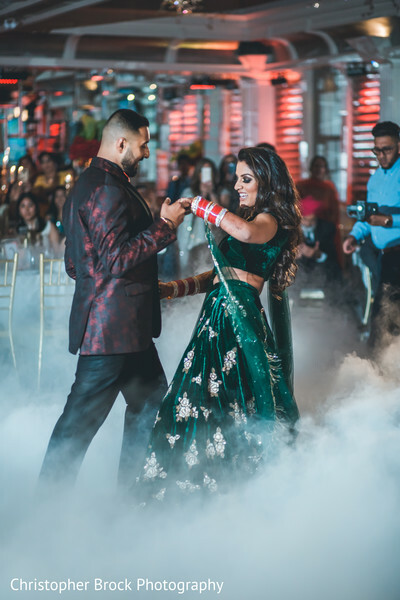 Behind the turntables, RokitBeats brought down the house with their pumping beats and made every guest dance the night away! These timeless portraits and candid shots were caught brilliantly, and there is more to see from the celebration event in the full gallery! 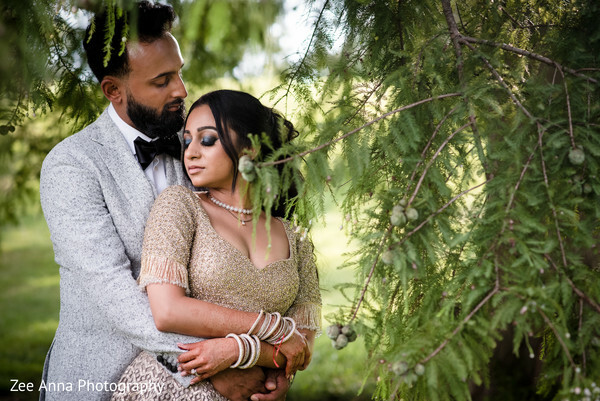 Hardeep and I met on our apartment shuttle, he was on his way back home from work and I had taken a personal day to relax and was coming back from some coffee shop with a friend. We exchanged a few words but everything was very casual. From then on, I kept seeing him on the shuttle but I never found out his name or any other details. Finally, some mutual friends introduced us and we never looked back. Hardeep claims, he knew I was the one after hanging out with me and some friends for just a few hours. For me, it took some time. I always had a gut feeling but when I moved 2 hours away and Hardeep still made the effort to come to see me every weekend, I knew he was a keeper. We were visiting his family in Milwaukee and were flying out that night but first, we planned a rooftop Mother's day brunch at The London House in Chicago. Little did I know that rooftop brunch was going to turn out to be the biggest surprise of my life. As we got to the top, Hardeep was waiting for me and dozens of roses. 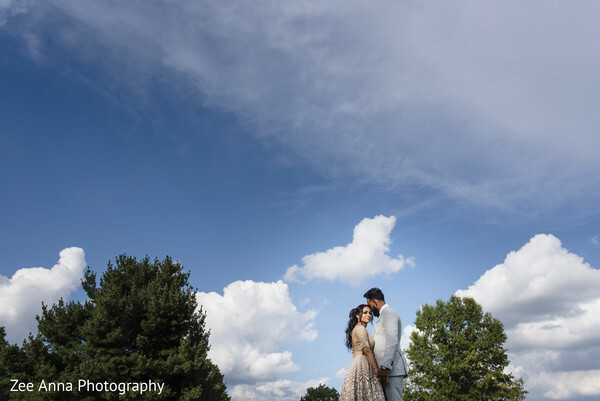 Everything about the day was perfect: the weather, the sun, the location and so, of course, I had to say yes. 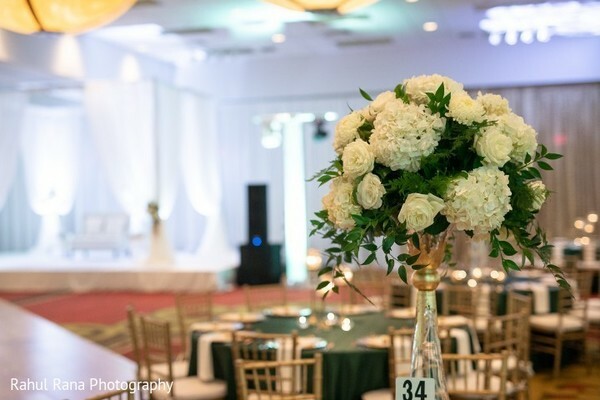 I stumbled upon Glamorous events during my research for event planning and after meeting with them and hearing their ideas about decoration, I went with them for both event planning and even decor. 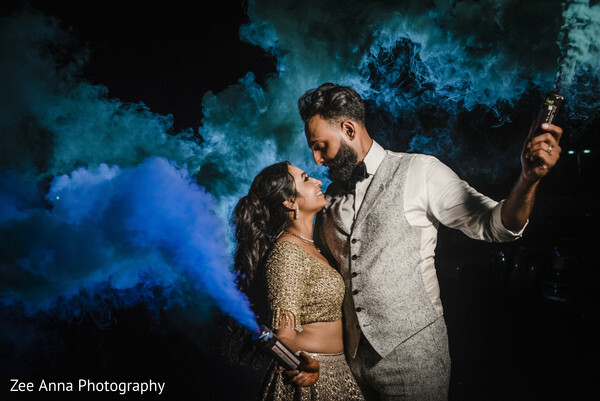 They brought everything Hardeep and I wanted to life, gave it their own touch and it was perfect. 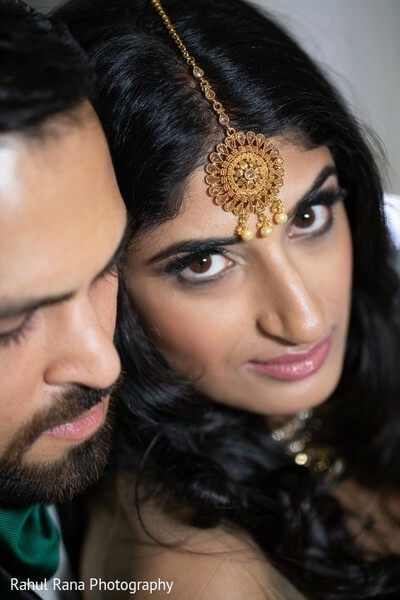 As far as hair and makeup goes, I knew I wanted Karuna from even before I got engaged. Especially for my reception, I had a certain look in my mind especially the dark eyes, and Karuna made that possible without going overboard. 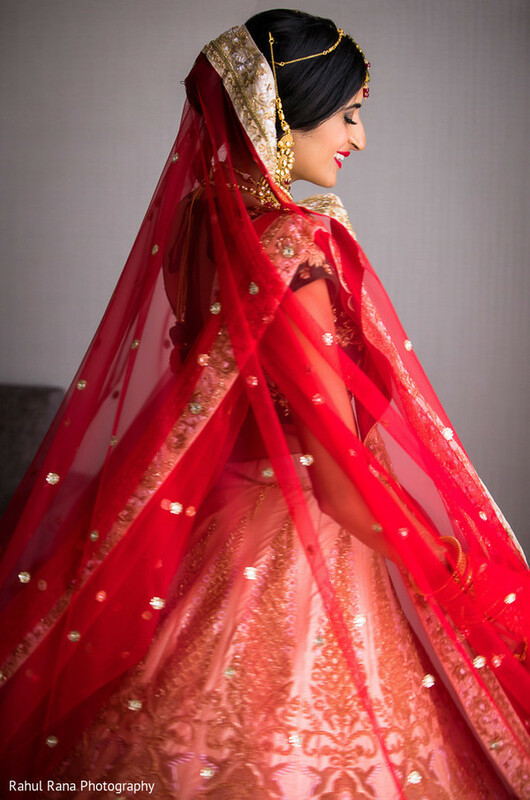 I had imagined what I wanted to wear on the day for my wedding but Karishma, a friend, and designer in India brought my imagination to life. The outfits took over 6 months to make but both of them were perfect. 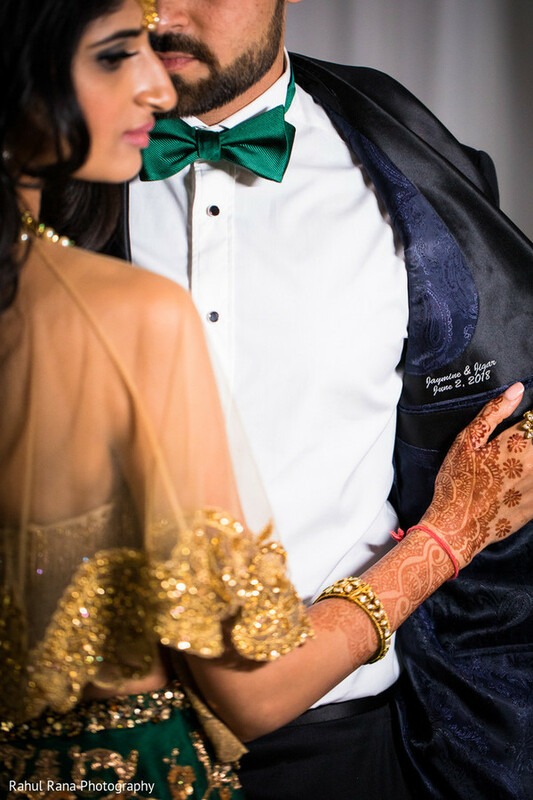 I wanted Hardeep and my outfits to compliment each other during the ceremony and so the same fabric that was used on my skirt was used as his collar on his sherwani. For the reception I wanted Hardeep and me to be the opposite and wear dark colors and keep our background champagne, so we can stand out. I went with green and Hardeep wore a black tux with maroon handwork. 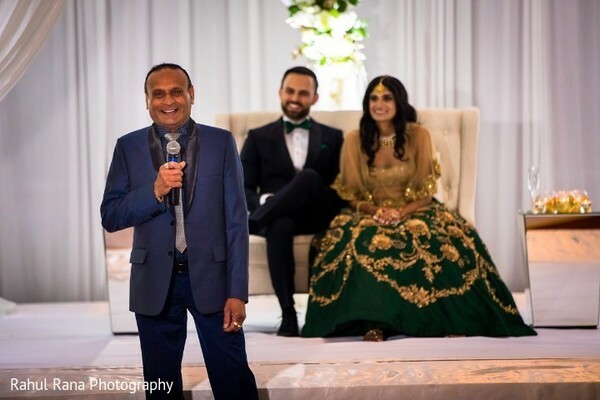 My entire family and Hardeep were very supportive in all my decisions about the planning process, the time that I got to spend with all of them planning the most important day of my life was the most special. 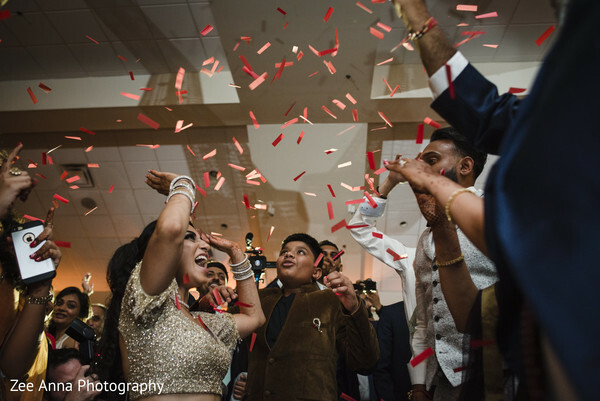 All of our guests would say that our wedding was a non-stop party. From the first night onwards everything was about everyone and not just Hardeep and I. 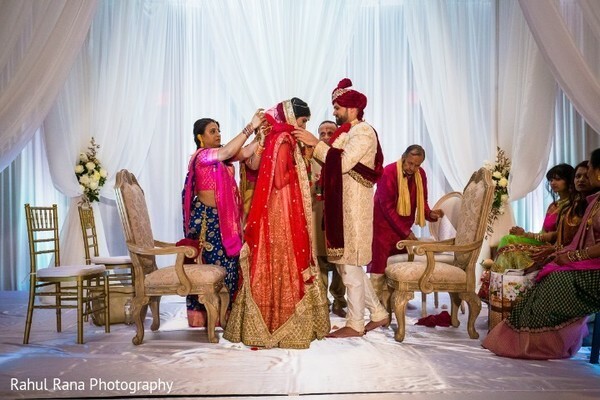 We both cherish our relationships with family and friends and wanted to make sure that all of them were a big part of all our ceremonies. After the wedding ceremony was complete, we were playing the usual wedding games with who can find the ring first. That has to be my favorite moment, only our immediate family and best friends were present and everyone was so involved in the game and the competition, it was a blast. 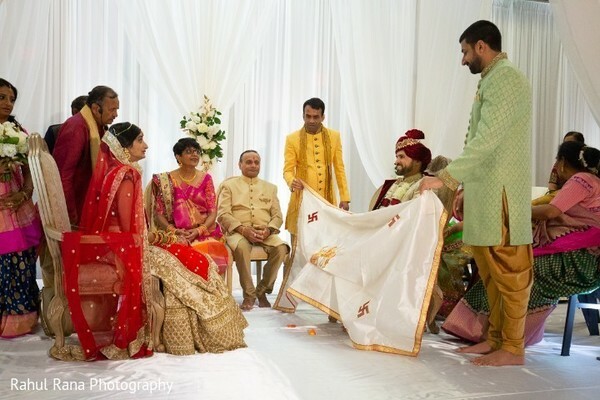 I always pictured my haldi ceremony to be outdoors with everyone wearing yellow. We decorated our entire backyard with white tents and yellow decor and all the women wore yellow outfits and the men white. The pictures don't do justice to how picturesque everything looked with the bright sun and cool summer breeze. As per traditions, I wore pink and used white flowers for jewelry. For the mehndi, I wore a purple outfit, and all the guests wore green, it was a night full of laughter, singing, and dancing. 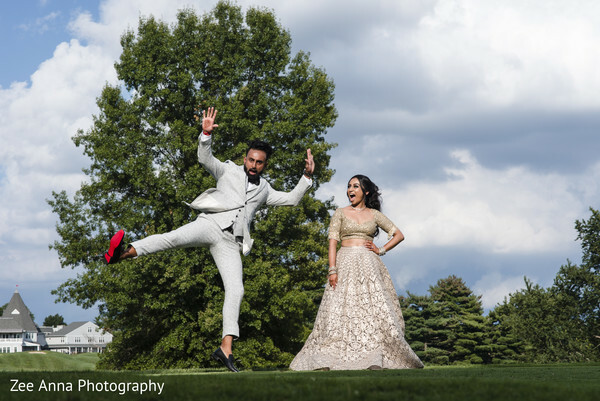 The best advice I can give is to start planning ahead and do a few things every so often because the day of it should be about YOU and YOUR GROOM. Do not stress yourself with little things that are bound to go wrong the day of, enjoy it because as stressful wedding planning is, the day of your wedding only comes once and it is done in a blink of an eye, so don't miss out trying to please others. For my henna I used Monita, she has to be the best in the business in the tri-state area. I wanted a semi-traditional henna design but with little details that were meaningful to mine and Hardeep's relationship. The first and the most special present Hardeep ever gave me was our little dog and so I got paw prints on my hands. To represent Hardeep's hometown of Chicago and my hometown of New York, I got skylines done for my henna. 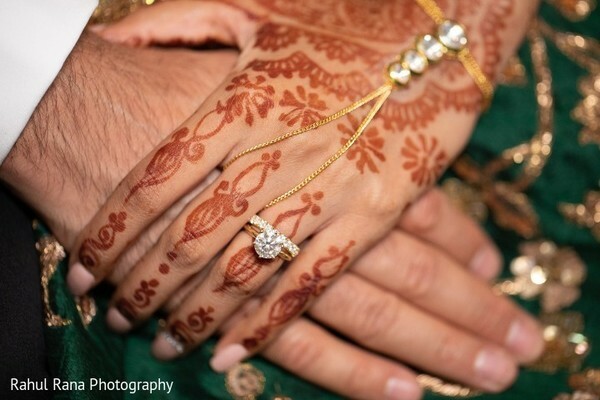 I also got a traditional bride and groom drawn on each hand. Every single person was impressed with Monita's skills and talents and amazed at the color of the stain in just a few hours. Have a wonderful day loves, see you tomorrow! 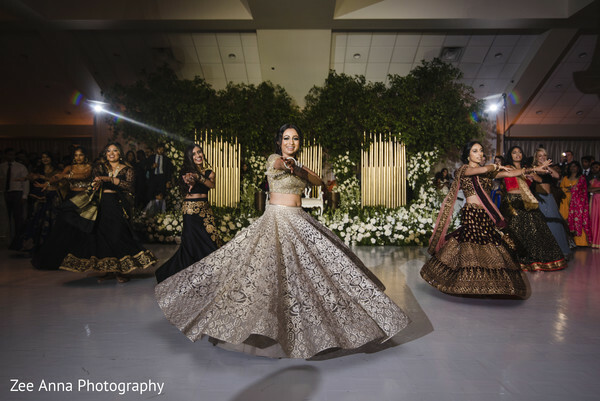 Christopher Brock Photography, Chateau Briand, Glamorous Event Planners and Kanwal Batool are members of the Platinum Guide. Love what you see? Explore their portfolios. 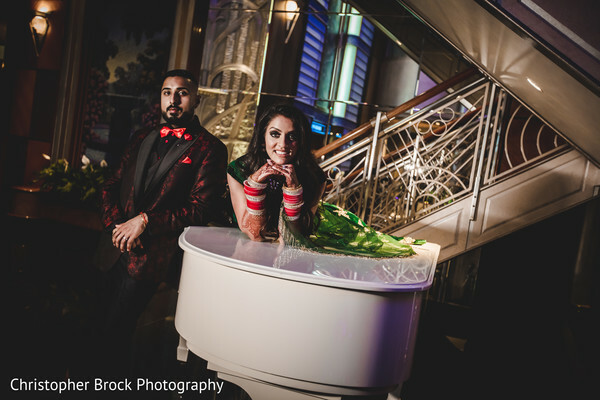 I am green with envy while perusing through Jaymine and Jigar's enchanting love journey at the Sheraton W Des Moines. 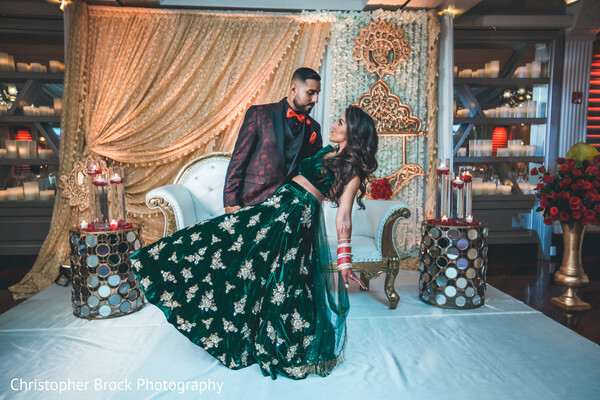 Today's featured editorial is jam-packed with an Indian vendor dream team. I have to admit that I just can't keep this cheesy smile off my face as I peruse through all these charming memories. 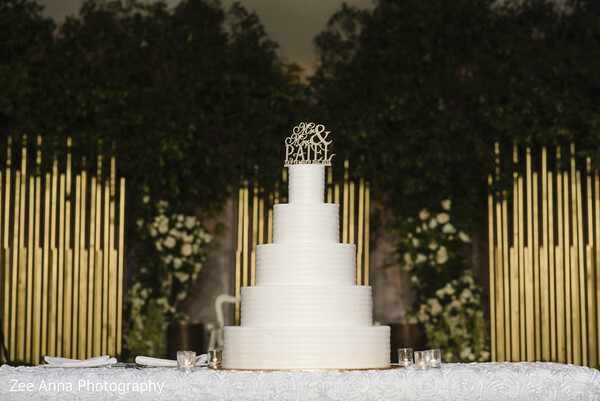 It is truly the details that set the venue apart and once again Bella Flora Event Design has amazed me to the core. 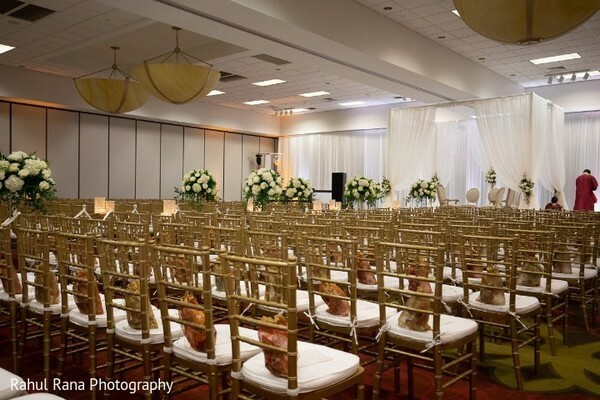 Lush floral arrangements set the tone for a fabulous event. 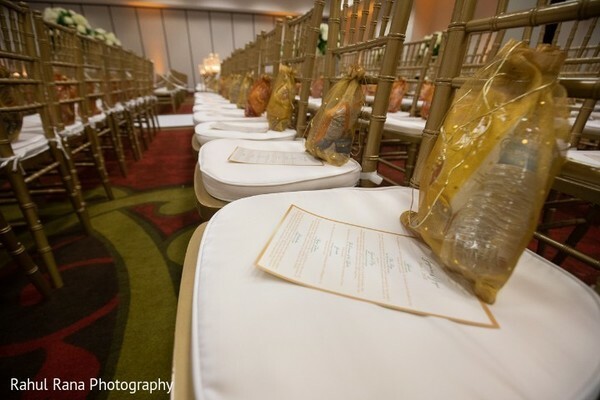 This event wouldn't have been possible without Events by C and Chowpatty Foods! I cannot wait to unleash the cinematic feature by Aria Cinema Films soon! 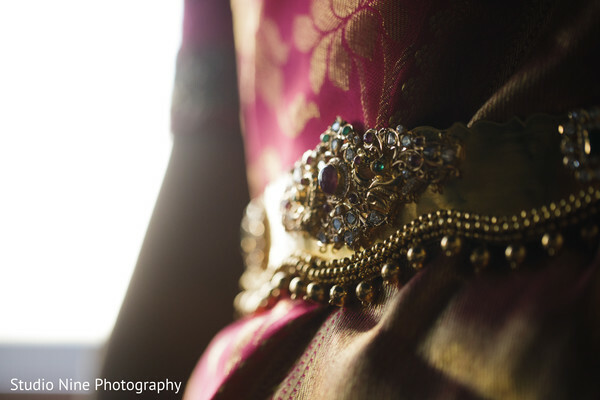 But, until then Rahul Photography has all the lovely memories waiting for you in our gallery. Happy holidays and we will see you tomorrow! 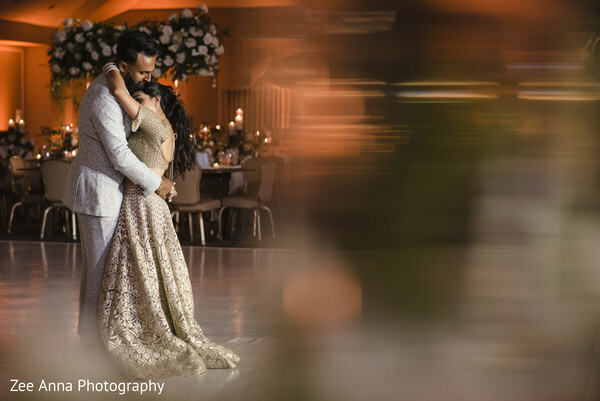 Rahul Rana Photography, Meghana Rose Make-Up, Events by C, Chowpatty Catering and Aria Cinema Films are members of the Platinum Guide. Love what you see? Explore their portfolios. 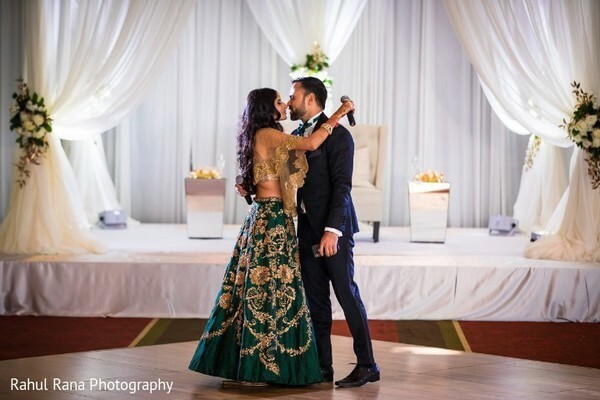 There is much love pouring out of the Sheraton W Des Moines with this stellar Indian wedding planned and designed by Events by C. Jaymine and Jigar's star-studded bash was full of iconic Maharani moments: Timeless elegance, astonishing décor, and one dazzling Indian bride. 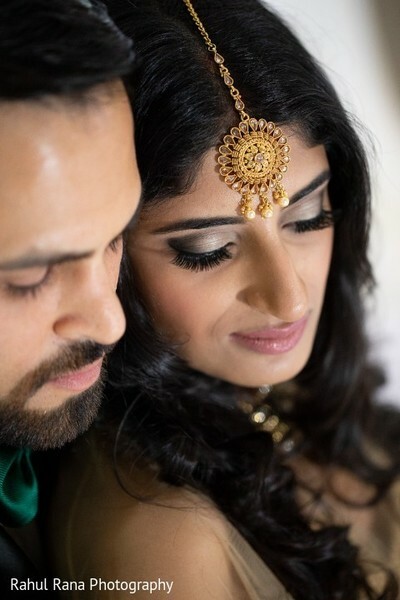 Whether it's a simple look or the latest beauty trend, Meghana Rose Makeup always ensures her brides look their absolute best! True love comes naturally! 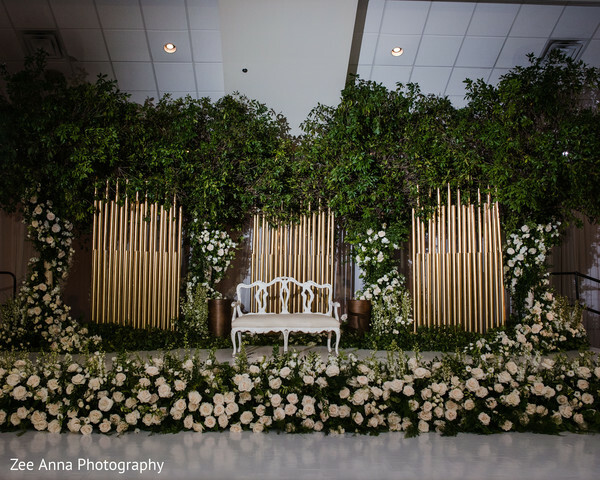 Bella Flora Event Design captured the spirit of the occasion with a flora and fauna mandap that set the stage for a gathering to be remembered. 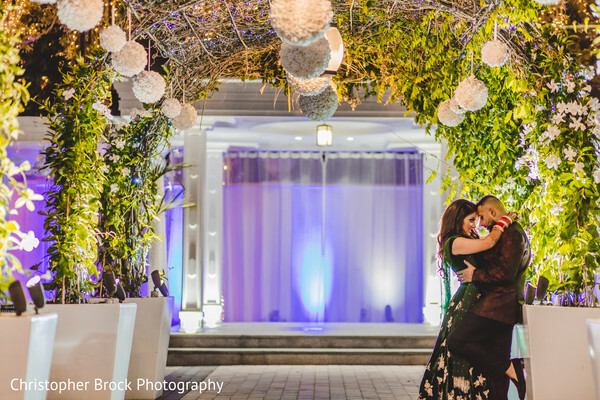 What resulted is a fairy tale wedding that is filled with romance and unique personal touches. 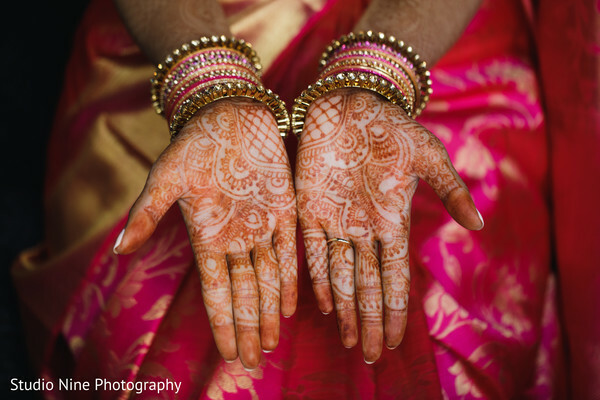 All the stunning imagery by Rahul Rana Photography is overflowing in our gallery. Coming right up I have the wedding reception shot to perfection by Aria Cinema Films with Chowpatty Foods dishing out all the eats!